"The hills are alive with the sounds of F1 music......" huh....whaaaaat....can't hear anything. Seriously though, Vettel needs to go for it...jump Max ASAFP. Kimi needs to hold station. If he can jump Lewis, then by all means. If none of the above, then go for the undercut or overcut. Looking for a clean race. No rain and looks to be a beautiful day. Hope it is a very eventful race ! Yeah Kimi needs a great start and go for it, if Ham doesn't move then shove him off the track, no point being polite. First 2 big corners have carnage written all over them at the top. Hamilton going after Bottas, because he knows its hard to pass during the race. Kimi on faster tires with no Seb in sight to watch out not to hit and pressured from Verstappen. Max being Max. Grosjean being in a place where he doesnt belong, going for it all in. Vettel frustrated on faster tires, expecting Grosjean to move over. Magnussen is a hot head. Ricciardo too far behind and trying to make up places right away. Hopefully we can stay out of trouble. 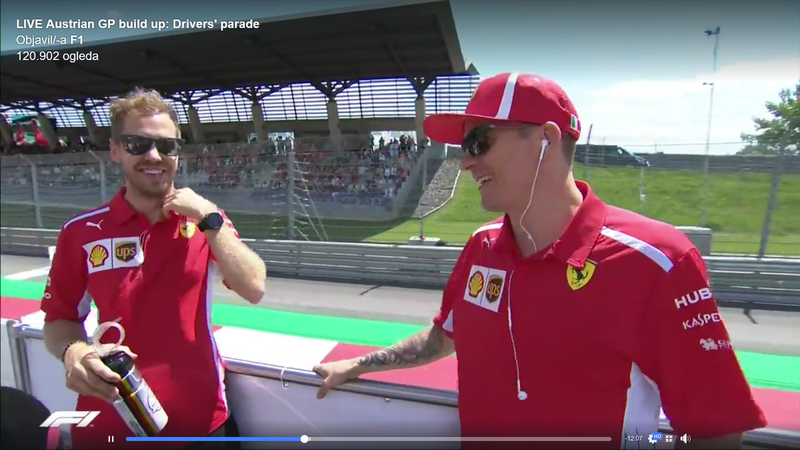 Vettel and Kimi having fun.Kimi is smiling. I don't watch pre or post race coverage anymore, but flicked over to Sky F1 to make sure it hadn't started yet and to mu surprise they were interviewing horner! They sure do have they're favourites at Sky but why do they need to give the same faces so much airtime every single race!? Yeah, Seb is in really difficult position, it is a miracle if he survives first lap. ...the new SF90 in the MATTE RED, to me it looks amazing. Let's hope it's gonna be as FAST as it looks. Seb is not far, if everything goes ok at the start, i am sure grosjean wont be hard to pass, and if he manages to get past verstappen, i am sure kimi will let him go if he is faster. What scares me about this starting grid is that Vettel have to get past 2 drivers with kamikaze tendencies. Are we the only front runners starting on US tires? For Ferrari I really hope it isn't! Any one watching Moto GP? That is a pure racing! Blink and things happen! I just want to go on record and state that I don't consider (never did) Fernando Alonso ever was a Ferrari driver. My 2 cents, those seasons never happened. It's just a black hole as far as I'm concerned because Alonso is a manipulative cheater and a liar that hurt Ferrari. I'm stating that before someone brings out my posts from 2010-2014. Other than that I've always been on our guys side, no matter what. It's all about winning and losing with guys that never hurt you before or after. Nothing else matters. Money doesn't matter. Only moral and ethical points scored matter. Nowdays Ferrari are being bullied by the powers that bought the sport and in the process bullied Bernie out of it. That's the state today. Striking back without political correctness is the only weapon still left to use. Ferrari have been robbed and bullied out of everything else. Whenever I watched on Sky. I really had to mute the sound, Sky and mainly Croft's constant fawning over Ham and Ferrari hate really made me want to throw heavy objects at my TV. So safer to watch it muted. It's a long race guys, anything can happen. We all might (hopefully) be cheering at the end of the race. So, Alonso is a cheater but you support MS? You do know MS had a season removed. It was awesome race! Let's hope this one in Austria is going to be as half a good as this one, with something to be cheerfull at the and! I will shut up now and watch the race. Forza Ferrari!! Go Seb, Go Kimi! Please..clean and fast start by both. I miss rosberg.... At least he kept lewis honest. All times are GMT. The time now is 22:04.